This idea comes from the Father of my main squeeze! He had all of his deceased cats tags filed away – and while cleaning out, decided to use them – partly for fun and partly as a memory. I simply purchased a bag of jump rings from my local craft store and found an inexpensive bracelet at the local teen jewelry store and used a small pair of needle nose pliers to attach the tags – isn’t it cute?!? What a great conversation piece ( a great excuse to talk about your companion animal!) 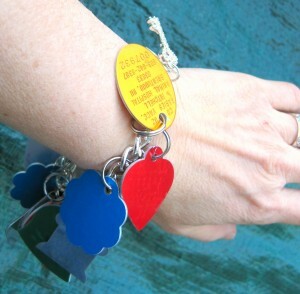 and one-of-a-kind piece of jewelry….. A nice way to craft with your child upon losing an animal as well.